It’s not fair to compare the 2004 film Lemony Snicket’s A Series of Unfortunate Events to the new Netflix series A Series of Unfortunate Events. Both film and TV show adapt the first three volumes in the wildly popular and manically melancholy series of books for children written by Lemony Snicket (Daniel Handler), though the Netflix series covers the fourth book as well. Both are art-directed six ways to Sunday, with muted brown and somber gray soundstages standing in for expressionistically bleak landscapes and baroquely decrepit mansions. Both feature beloved actors in small-ish roles (Film: Billy Connolly! Luis Guzman! Catherine O’Hara! ; TV: Patrick Warburton! Aasif Mandvi! Catherine O’Hara! ), and both attempt to achieve the singular tone of the books. It’s the specificity of this tone that made the books such a success. As Handler himself has noted, it owes a great deal to Roald Dahl and Edward Gorey. There is a deliberate, buttoned-up, achingly Anglophilic quality to the prose; dreadful events are related in a manner engineered to keep us at an emotional distance. Characters and story beats are tut-tutted at, readers are admonished to skip pages ahead, and constantly given schoolmarmy vocabulary lessons. As a result, the mood of the books is waspish, even arch, but never grotesque. “Whimsically dark” is a narrow sliver of narrative real estate to build a story on, yet it’s there that ASoUE lives. It’s the Netflix series that comes closest to achieving that tone, for two reasons. One, it foregrounds Lemony Snicket. Jude Law played him in the movie, but chiefly in voice-over. The Netflix series turns him into a kind of omnipresent, lachrymose host played with deadpan, note-perfect solemnity by Patrick Warburton. In the series, Snicket is constantly stepping into the shot to impart some new nugget of depressing information, or express concern at something that has just happened, will soon happen, or is happening. He’s like Rod Serling at the beginning of The Twilight Zone, if an episode ever featured Neil Patrick Harris in drag. Snicket’s physical presence turns out to be important. 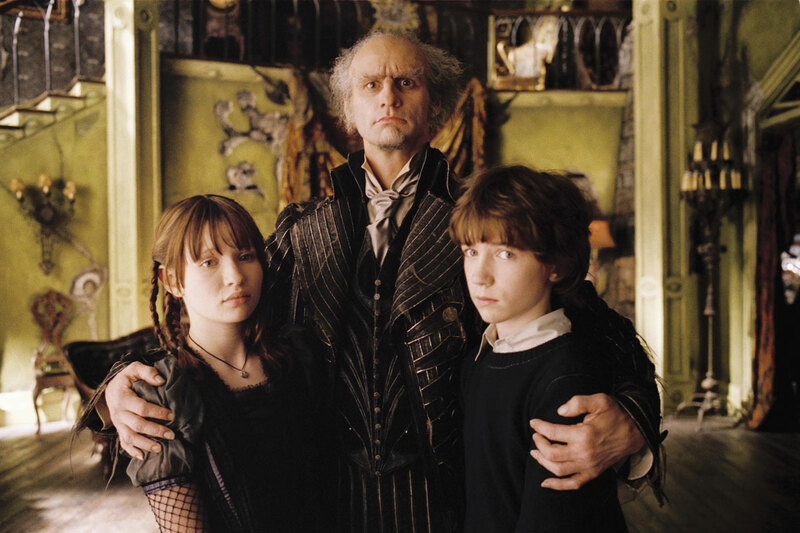 In the movie, Law’s voice-over did much of the same work, or tried to, but having Snicket literally step into the proceedings to warn us about what we’re about to see next feels exactly like those moments in the books when Snicket’s narrator would admonish us for reading him. But the big reason it all works? Neil Patrick Harris’ evil Count Olaf. Look, it will likely not surprise you to learn that the acting choices Harris makes as the villain of the piece are generally smaller than those made by Jim Carrey in the film. The film was big, and Carrey made it bigger, and it’s hard to fault him for it. As written, the character of Count Olaf is an old-school mustache-twirler, after all; he’s operatically evil. And when called to do so, Harris can twirl with the best of them: He can lean into Olaf’s dastardliness with a fervor that chews its way through the scenery, and the props, and much of the craft services table to boot. Mostly though, Harris’ Olaf vibrates at a lower frequency. When he’s not being performatively nasty, he seems merely … annoyed. Tetchy. Distracted. Impatient. Vexed at the world for not appreciating him. It’s smaller, and feels truer, than anything Carrey managed to find in the character. It’s also variation on Harris’ Dr. Horrible — a guy who can turn it on when he needs to, but whose malice seems like an act. Maybe that’s why his vaunting lust for the Beaudelaire fortune doesn’t seem so much all-consuming as … something to do. Should we get another season of the series that takes us further into the books, those smaller, humanizing aspects Harris is injecting into this cartoonish villain will pay off in ways I probably shouldn’t spoil. But I keep thinking of a scene in one of the later episodes of the TV series, in which Olaf is asked why he does the things he does, why he torments the three Beaudelaire orphans so much. “Because it’s fun,” he says. I buy that; NPH sure looks like he’s having a blast.